Assalamualaikum wbt semua. 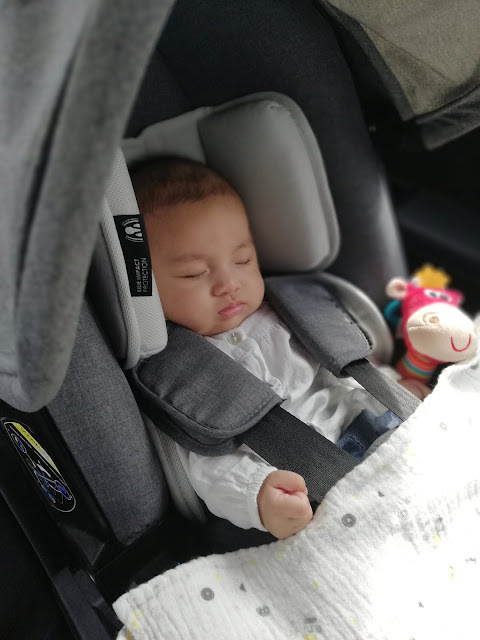 Hari ni Anfaal nak share our experience handling baby with sore throat and fever after vaccination. Last month, Micha had her 3rd month vaccination at Prince Court Medical Centre (PCMC). She had her second shot of DTaP, Pneumococcal and Rotavirus which costs us few hundred ringgit for all those. I mean, we do have a cheaper version or maybe free ones but since we have Micha's record at PCMC and it was her paed who gave the shot, we thought just go with it first at PCMC. Anything happened (touch wood), we could easily trace back in their record. Lepas je kena vaksin, Micha okay je lagi. Tak ada apa sangat. Being a first time parent, we do not encourage drugs (ubat) after kena cucuk. After being reminded by my mom to fed her PCM (Paracetamol), we still insisted cause she looks fine. Well, now we know what to do after her vaccination shot next. Straight away give her PCM within 24 hours after vaccination. Takut nanti demam. Kena cucuk hari Selasa, hari Rabu still okay lagi but Rabu malam she dah started to scream and scream and feel uneasy. Dah start nak demam and we thought she kena buatan orang for some reason cause she cried like takut sesuatu. Seriously at that point of time, everyone was trying to calm her but failed. At last, when i held her she fall asleep straight away. Kesian tengok masa tu, all of us don't know what to do, seriously. 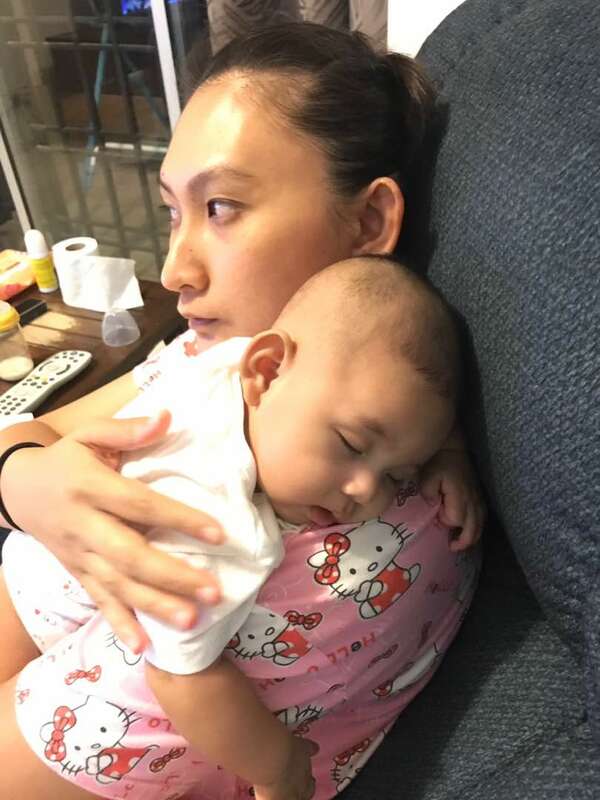 She won't drink her milk, she just wanted to sleep. Even hated her pacifier (OMG that was her BFF okay!). After days and endless nights of fighting for her to just drink her milk, we decided to bring her to PCMC on Friday after Friday prayers to have her checked. After the examination with Dr. Choy, he confirmed that she's having a slight fever and sore throat so he prescribed some antibiotic and probiotic. 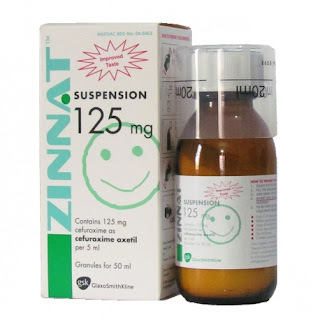 The antibiotic is from Zinnat Oral Suspension which she has to take it for 5 days straight, 2 times per day. The dose is about 2.5mL per feeding and this has to be kept inside the refrigerator at all time. The taste of this antibiotic is not tasty at all but the smell is quite pleasant. Since she's taking antibiotic, doctor advises to also take Probiotic as well so the ones that we have is the Prolactor Probiotic. This one we have to store it inside the refrigerator as well as it contains 10 billion CFU (Colony Forning Units) of good bacteria. So hopefully it'll be good for Micha as well. This one we have to continue giving it to her even after the antibiotic. Since the taste is super yummy (Strawberry) so Micha likes it so much. Hehe. Pengalaman we all, bila anak tak sihat, demam dan sakit tekak, she does not want to eat because the milk yang sakitkan lagi tekak dia. Biasalah, first time kena of course sakit kan. Tak pernah sakit before this. 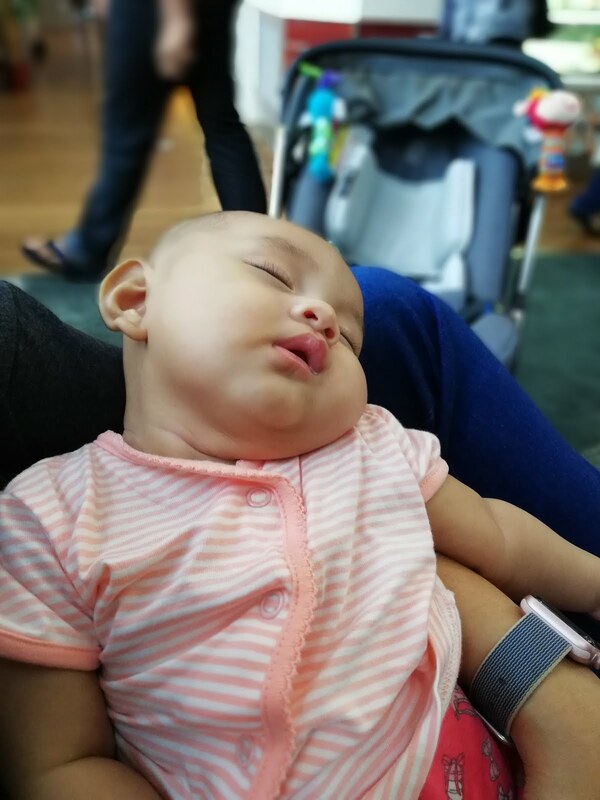 Sometimes, nearly 12 hours tak minum susu cause she does not want to. 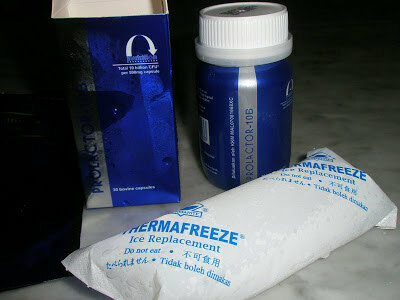 So, nak tak nak we gave her Paracetamol (PCM) prescribed by her paed to reduce the pain and it works! Seriously, lepas makan PCM (Axcel brand) she could drink milk like she's forgotten about the sore throat pain. So, we ended up giving her PCM from Friday night until Sunday morning. Alhamdulillah, her sore throat went away after 5 days (from Wednesday-Sunday). 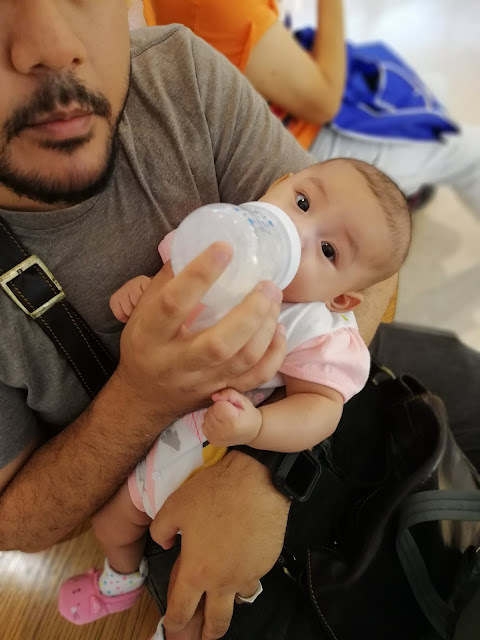 On Sunday, we went to IOI City Mall to buy some groceries and we tried to fed her milk and she drinks it like she's no longer sick! We were surprise to see that cause usually she'll refuse to drink milk at all. So then we know that she has healed and is healthy as ever. But still, she has to take antibiotic for 5 days even after she's feeling okay. Takut sakit tu datang balik nanti. Alhamdulillah, although we have to use drugs to her and i know it is not good at all, to me as long as she's drinking milk, i akan rasa lega. Plus, all of these are being prescribed by her paed so we feel confident to use it on her. Hopefully she'll be as healthy as ever after this. Now we know, lepas kena cucuk vaksin je kena bagi PCM just to reduce the fever.